The Friends of Gosport Museum are a group of people interested in the Gosport Museum. This includes the Museum on the Mezzanine in the Discovery Centre. SEARCH and the Gosport Gallery in the building on the corner of Walpole Road and Clarence Road. The members give support to the organizers where they can, which is very important at a time of reorganization. early days of the Friends of Gosport Museum. 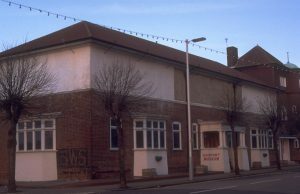 Gosport Museum was founded in 1975 to record all aspects of the history of Gosport from the earliest times to the present. It was housed, where the old Central Library had been. The Grammar School was in there before that. (This is building in the photograph above). The Friends of Gosport Museum was created in 1990. The inaugural meeting was held in the Gosport Council Chamber on Monday 22nd October at 7pm for a 7.30pm meeting, which set-up a Steering Committee. After 4 meetings of that committee, the Founder Members Inaugural Meeting was Monday 20th May 1991. I have been advised that the first membership was paid and membership number issued, 9101 on the 15th March 1991 to Margaret Roberts. Thank you to David Moore who gave me that information and cleared up a number of questions I had about the past officers and committee. I feel the beginning of The Friends of Gosport Museum was that date. Membership of the Friends of Gosport Museum is open to all at a low subscription. This will remain at £6 for individual member and £9 for a couple for both 2017/18 and 2018/19. You can just be a supporter or do as much as you wish such as volunteering to steward exhibitions, helping visitors and answering questions. They sometimes have events for schools and others to hear about the past, so some members talk about their time when younger to these groups. There is a committee you could join and one post has been vacant for a few years, Project Director, directing research and events. There is a list of resource items available to lend to FoGM Members. I have also added the rest of the newsletters back to the beginning of the Friends of Gosport Museum. There may be one missing from the early years. If there is and you have a copy, please could you lend it to me to scan and add to this web site. BAfM Friends of Gosport Museum is no longer a member of the British Association of Friends of Museums. Gosport Local History Luncheon Club Group meets around once a month at lunch times for history talks and discussion. Gosport.info Information, Photos, History and Memories of Gosport.